Conversations about more bikeable streets in Newtown, Berhampore and Mt Cook suffered from being in the “fallout zone” of the Island Bay cycleway conversations. Four years later, Wellington City Council is having another go. This time, they’re asking people well before there’s anything tangible on the table. Guest poster Baz gives his take on the first big engagement for “Newtown Connections”. 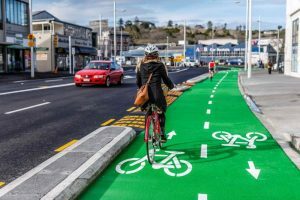 Wellington City Council has stayed committed to improving cycling on our city streets. Why, when it’s been a real fight? Quay St, Auckland – would Adelaide Road deserve the same? Because getting more ordinary people cycling addresses a range of important issues, such as the need to meet our low-carbon commitments, improving traffic flow and safety, and supporting healthy communities.Learning from Island Bay and elsewhere, the Council is now creating a plan for making Mt Cook, Newtown and Berhampore easier to bike around. Last week an initial six-week engagement closed – a new approach which looked much better. WCC had received 738 online responses by Tuesday afternoon, plus an unknown number of hard copies. I can’t think of any similar community engagement that has received so many responses. Full credit to WCC for an active engagement process.It appears a wide range of people have had their say, judging from the age split. It’s particularly encouraging to see that one in eleven people responding were aged under 19. There’s a range of responses, but it’s clear there continues to be a strong appetite for better bikability. While remembering this is “an opt-in survey” (in case Mike Hosking gets confused), it’s a great result for one reason already. It’s a big deal just getting this amount of input from busy people before there’s anything on the table we can get our teeth into (parking, speed limits, buses…). The challenge is now for the Council’s consultants to come up with plans that meet high expectations for safe and attractive streets. Then the public will want to have their say on the designs. That will take time, but it will be worth it to get a good result. Did you give your views on in this early engagement? What did you think – has WCC learned? 76% very important – amazing. I wonder had they run this survey in Island Bay early on, what they would have got.